Mirror Picture Frames have their special place in corridors, on walls, and in foyers. These are the traditional spots homeowners opt to hang mirror picture frames, usually to broaden up a room’s width or bring more light and illumination into an otherwise dark and enclosed space. But what about using mirror picture frames to create drama or to give the sensation that you are outdoors? In Adelaide, mirror picture frames are used in more creative and stylistic ways, past their simple light-reflecting functionality. Let us illuminate you with these five unexpected ways to use Mirror Picture Frames in Adelaide when decorating your home. In your garden? Yes. Absolutely. It’s mysterious, whimsical and instantly brightens up your garden’s dimensions. It’s especially useful in “urban gardens”, which are green spaces that are nestled within. It’s not just about the refraction of light that makes mirror picture frames in the garden so aesthetically pleasing or smart to use. It’s the fact that the picture frames themselves can create their own thematic look. Carvings on the mirror’s picture frame, for example, can be painted or hand-carved to create a particular kind of look. Place them at specific points in your garden like in the corners, or set against a wall, with plants set against the frames. Designate a blank wall in your living space as your “gallery” wall and mix up artwork along with mirror picture frames. This allows you to create dimension and drama, breaking up a wall of art with different shapes of mirror frames. You can also use mirror frames in various sizes, colors, or opt for more ornate picture frames in order to set an aesthetic look. Now, it may not seem like the space behind your stove is the best place for mirrors. You might immediately think of grease stains, steam, and everyday wear and tear. However, mirrors behind your stove don’t have to be the size of your wall. You could opt to do a backsplash with mosaic mirror pieces or simply use a combination of circular and rectangular frames, to create a little light and depth. How do you instantly open up space? Take a page from the Yayoi Kusama exhibitions and use the reflective nature of mirrors to create interest and depth in space. In a small and enclosed space like a dining room that’s tight on space, you can use mirrors set within a metallic grid on two walls that meet at a perpendicular corner. Not only will these walls reflect light off each other, but the metal grid also makes space instantly feel as though there are windows. It’s the newest trend in interior design: Using mirror picture frames of different shapes, heights and even colors, layered over each other. Some mirrors are directly placed one on top of the other while some are simply overlapping. Other mirrors are picture frames with ornate and heavy framing, but they’re placed on a low cabinet, leaning and overlapping together to create a really vintage, old-world look. No matter what aesthetic or time period you’re going for, layered mirror picture frames can add instant appeal. Inspired yet? These are just five ideas you can use to bring the beauty and creativity of mirror picture frames to your home in Adelaide. But don’t stop there — you can find many more ideas by flipping through the online portfolios of interior decorators. Use these as a jumping point to re-evaluate your own space and think outside the box — or, in this case, outside the frame. 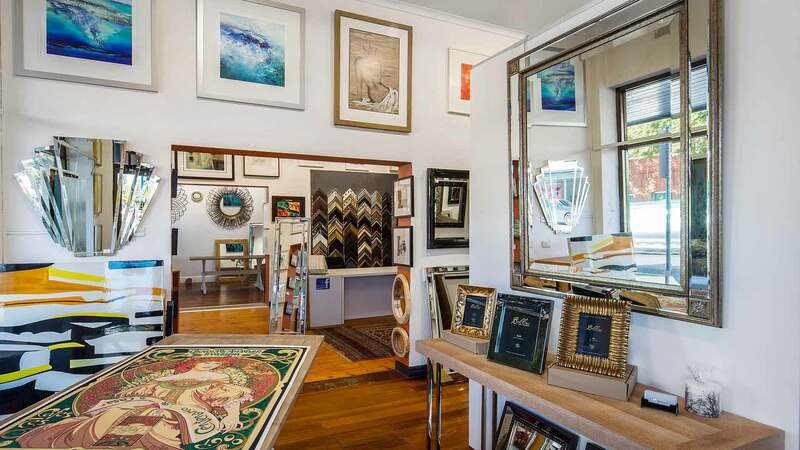 When you’re ready to choose the right mirror picture frame, visit our expert framers and gallerists at Art and Frame in Adelaide. We’re not just technical specialists — we live and breathe home decor, art, printmaking, and hanging. From stunning room makeovers to crafting the perfect finish for an artwork you’ll love for decades, Art and Frame are your Mirror Picture Frame experts in Adelaide.